This week ArrrCee and dumptruck escape to another universe! The Quake 2 universe that is. Donde takes us on a decades-long journey through the worldwide Quake 2 multiplayer scene. He documents the historical, sometimes hysterical and always human stories starring gamers from around the world. 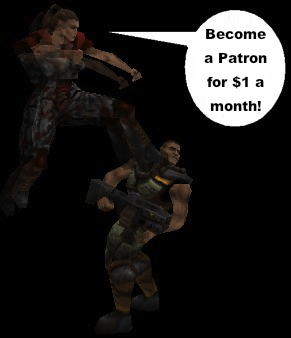 It's late 90's gaming history, one Quake 2 story at a time. Another weird, wonderful and sometimes deeply poignant edition of the QuakeCast. Guerrillas In The Midst is quite new to the Expert CTF community but the players within GiM are very experienced quakers who have played Expert CTF before. All have the same goal when it comes to quaking and that is to work with each other and to have fun. GiM will strive to be one of the best Expert CTF clan while concentrating on teamwork and enjoy the game as much as possible. After all...it's only a game!